Are you ready to slip into something really comfortable? Welcome to Sunset Chalet. 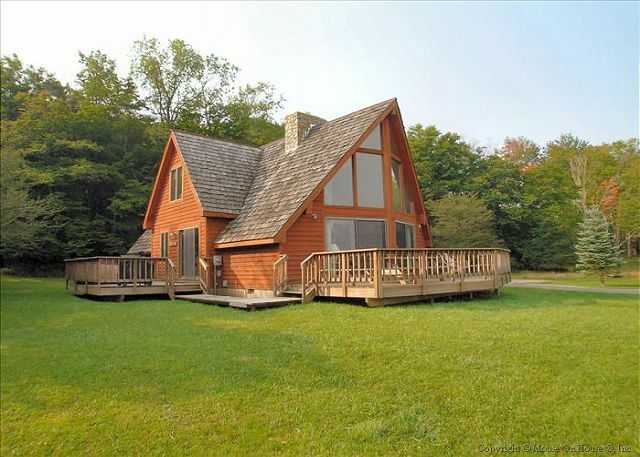 This lovely home provides the perfect space for a family vacation or friendly retreat. Skiers will enjoy the convenience of easy access to local attractions and activities. Spring, summer and fall guests will applaud the easy access to Canaan Valley's National Wildlife Refuge hiking trails. In any season, Sunset Chalet offers a large yard for snowman building or butterfly chasing…and one of the best sunset views you could ever hope to find. Moms will appreciate the well thought out kitchen and dads will adore lighting the logs in the beautiful stone fireplace. Every renter will enjoy cable TV, unlimited long distance, and WIFI. This is a very nice house. Has everything that you need. Hot tub is a huge plus. Perfect for hikers or skiers. The chalet was had plenty of room, and the management people were excellent. House was beautiful. Hot tub was hot. The management company we dealt with was over the top accommodating and extremely professional. I highly recommend dealing with Donna and Amy at Best of Canaan any time you plan on visiting the Canaan Valley area. The entire process was smooth and easy. We picked up our keys using the afterhours code. There was plenty of firewood cut and stacked. The chalet was clean and spacious. My sons were pleasantly surprised by the foosball table. The house was clean and warm. We played catch in the big front yard. We cooked in the kitchen, but also ate in all the restaurants in Davis and Thomas. Blackwater Falls State Park, Dolly Sods Wilderness Area, and the Canaan Valley National Wildlife Refuge Area provided tons of hiking opportunities, and close! We didn't use the hot tub, but it was ready to go. The experience was just what we were looking for, a quiet getaway in a scenic location. Very cozy! We had a wonderful stay at the Sunset Chalet. Everything was as it was described. We especially enjoyed the fireplace and having the wood provided for us. We certainly enjoyed our getaway here and hope to return at some point in the future. Rental experience was fantastic! Cabin in need of "deep cleaning"....cobwebs on ceilings. Several light bulbs burned out; no replacements found in cabin. Great place, stayed here for ten days in the summer, everything was great.The house was clean, the property was beautiful,there is plenty of beds. The nature there is absolutely unreal we saw a bear, and deer all over. There is so much to do there. The hot tub was an addded bonus cause it was perfect without it. I highly recommend this house. Thank you for the stay! My friends and I loved the convenience to the slopes and the hot tub! Fireplace was also very nice. Beds were comfortable and very clean. Would love to come to the chalet again. Good , but have been a little cleaner but still had agood time. There was no fire wood for a fire . This was a very positive experience. The cabin is super clean and well maintained. Views are wonderful. Only cons is country road next to the yard, where drivers do not necessarily follow speed limit, so if you have kids playing in the yard you must keep a very close eye so they don't run into the street. Sunset Chalet was in a great location and very clean with all the extra thing you need. Had a GREAT time and we will be back next year. Motorcycle run in West Virginia. The setting for this 3-day vacation was beautiful. First time in West Virginia and the area was breath taking. We were pleased with our accomidations and stay. The home seemed abit dated but very well maintained. We would look to stay here again. We had a very memorable experience at Sunset chalet. Beautiful location. Sitting in the portico and watching the mountains and sunset is a wonderful experience. Great stay, could even walk to Timberline downhill slopes! A fine Vacation Cabin but with a few maintenance issues. We had eight adults and two infants staying in Sunset Chalet; the cabin held us all just fine, even though to look from the outside it appeared it might not. With that many people sit-down eating was tight but do-able. Hot tub on the deck was much used and enjoyed. The main reason I did not give five stars is that at least three of the eight dining chairs were on the brink of collapse. Another significant issue was the oven temp control did not work (after extended cooking time supper still came out raw). At least the microwave worked well, which bailed us out. You might inquire about whether the chairs have been replaced before renting. Our stay at the sunset chalet was great! We had an awesome week! The hot tub was sweet! I would highly recommend this for a great getaway in the WV mountains!!!!! The Ladies at Best of Canaan were very helpful and friendly. The house had everything we needed for our stay. Great experience and will definately reccommend Best of Canaan to our friends. We had a great time at Timberline. We were impressed with how well the chalet was equipped, especially the kitchen. It was clean and we'll maintained. Overall we are very happy with the Sunset Chalet. This was an upgrade for us from a smaller property, and so we checked only one of the four bedrooms. There is a clear view of the western horizon, and with the deck wrapping the western side of the chalet, if can be great sunset viewing. Great 20' ceiling and fireplace in spacious living room. A few small points: showers are a tad small and the large pile of firewood it not quite dry enough for use. Overall am awesome stay. Very clean and Donna at Best of Canaan Realty is fantastic to work with! Besides the driveway not showeled when we got there and the dishwasher not properly working we LOVED it. It was very clean and the staff was great. Would def. stay again! Thanks for taking time to give us your input. We are sorry that the driveway was not plowed when you arrived. Our snow removal folks do their best to keep up but sometimes Mother Nature wins. We hope you will return...and we promise to do our best to have things ready for you. We really enjoyed our stay at Sunset Chalet for two rounds of golf at Canaan Resort. Excellent location in a nice, quiet, peaceful setting. Highly recommend. It was a fantastic vacation! OMG. this place was soooo clean, pretty and romantic!! Great place for a big group - loved it!